Hummingbirds: The Most Unique Birds On Earth? 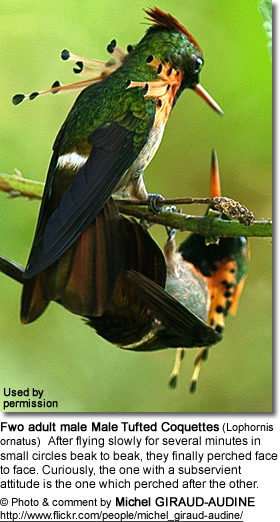 They are among the smallest of birds, and include the smallest living bird species, the Bee Hummingbird. which weighs less than a U.S. or Canadian penny. Smallest Size Body: Hummingbirds are unique amongst birds because of their small size (2 - 20 g or 0.07 - 0.7 oz ), elevated average body temperature (~40° C or 104° F), and rapid heart rate (up to 1,260 beats per minute) (Johnsgard, 1983). Largest Sized Organs: They have the largest brain (4.2% of the total body weight), the largest heart and the largest breast and flight muscles (30% of its total body mass) in proportion to body size than any other bird (Long, 1997). Feet: Their feet are weak and are only used perching. With the exception of insects, hummingbirds have the highest metabolism rate of any animal on earth (high breathing rate, high heart rate, high body temperature). Because of their "extreme" metabolism, these active tiny birds require frequent feedings throughout the day - every ten to fifteen minutes and potentially visiting 1,000 flowers a day, lapping up nectar at the rate of 13 licks per second. They have to eat up to half of its body mass and drink roughly eight times its body mass each day. In preparation for an impending migration, they may consume 3 up to 10 times their body weight in food - about 14,000 calories per kilogram - per day. (Humans consume, on average, 26 calories per kilogram per day). Before migration, these birds will almost double their weight as they store up fat to serve as fuel and hence increasing their potential flying time. To conserve energy at night when they are not feeding, their bodies go into a state of torpor (temporary or semi-hibernation). During this time this bird's body temperature drops down dramatically from its daytime temperature of about 105° (40.5°C) to 19 °C (66 °F) and the heart rate slows down from about 200 (average daytime resting heart rate per minute) to 50 - 180 beats per minute. These birds may even stop breathing for periods of time. This allows them to use up to 50 times less energy than they would need during their daytime activities. During this time, they cling to a branch and sit almost lifeless; sometimes their feet (which are known to be quite weak) will loosen their grasp enough to swing downwards and remain hanging upside down on the branch until the next morning or until they become alert when approached. This so-called "suspended animation" also enables them to survive cold nights or any time that food might be scarce. At sunrise, the body temperature goes back up (which can take a few minutes up to an hour), and they will resume their normal activities - typically feeding before doing anything else. However, whether or not these birds become torpid depends on their diet, health and type of activity they are engaged in (Long, 1997). For example, nesting females do not enter torpidity when incubating eggs as they need body heat to keep the eggs warm. Not always torpid ... However, whether or not these birds become torpid depends on their diet, health and type of activity they are engaged in (Long, 1997). 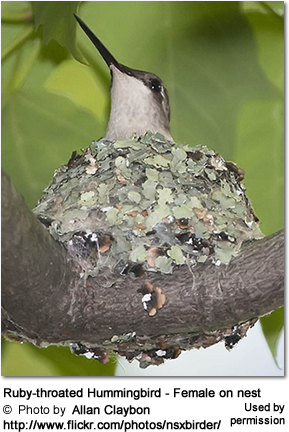 For example, nesting females do not enter torpidity when incubating eggs as they need body heat to keep the eggs warm. The Fastest Heart Rate of Just About Any Being on Earth! 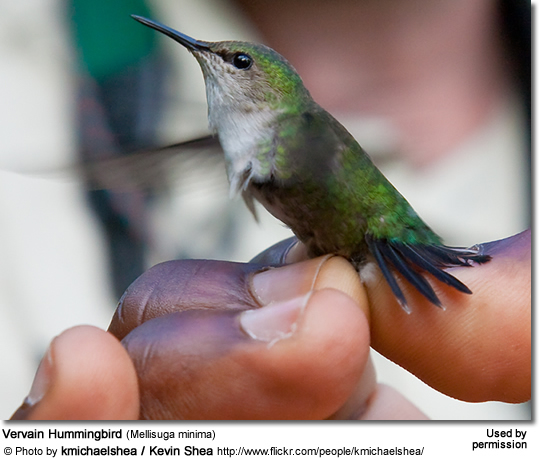 The hummingbird has the largest heart in proportion to its body - and has the highest heartbeat rate. Their hearts pump about 1,200 times per minute in flight (1,260 beats per minute were measured in a Blue-throated Hummingbird) and 200 beats per minute at rest– making it the fastest beating heart of all animals - except for the pygmy shrew with a recorded heartbeat of up to 1511 times per minute. (A shrew is a small animal that resembles a mouse – it occurs in Asia.) Their wings beat seventy times each second; and their hovering flight used by them to gather nectar requires staggering amounts of energy. Their daytime body temperature ranges from 105° to 108°F (40.5° to 42.2°C). 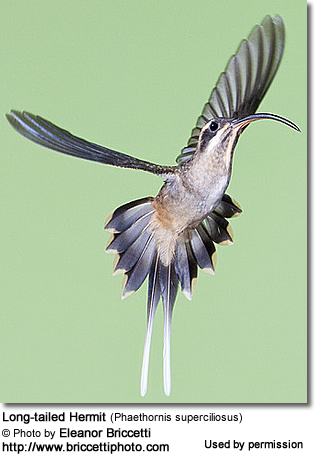 Unique flight abilities: Hummingbirds have skeletal and flight muscle adaptations that allow them to rotate their wings almost 180° - enabling them to fly forwards, backwards, up, down, sideways, even upside down. The unique structure of their wings allows them to beat their wings in a figure-of-eight pattern, making them capable of intricate aerial manoeuvres, including remaining stationary in the air, enabling them to hover in front of flowers as they feed on nectar. In fact, these tiny birds are more maneuverable than helicopters. Flight Speed: Their normal flight speed is 30 mph (48 km/h), but they can reach 50 mph (80 km/h) during an escape or chase and even 63 mph (101 km/h) during a dive. they also spend a higher percentage of their lives flying than any other species. All of this is amazing particularly considering that these tiny birds weigh as little as a penny. Hummingbirds are named for the audible low-pitched humming sound made in flight. This humming sound is made by the wings, and the sounds differ depending on how fast the hummingbird beats its wings. 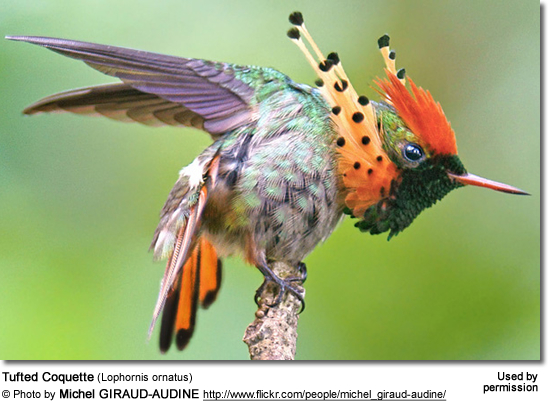 Eachs hummingbird species generates a different humming sound in flight.